A ST survey found 59% of respondents preferred the flat fare over the route-based fare, but roughly 40% said the flat fare option was neither affordable nor equitable for riders. Nearly 90% of respondents did say the flat fare option is easy to understand, with only 59% saying the same about the route-based option. Both options would increase farebox recovery, with the flat fare adding between $800,000 and $1.3M — a revenue gain of 2.1 to 3.6%. 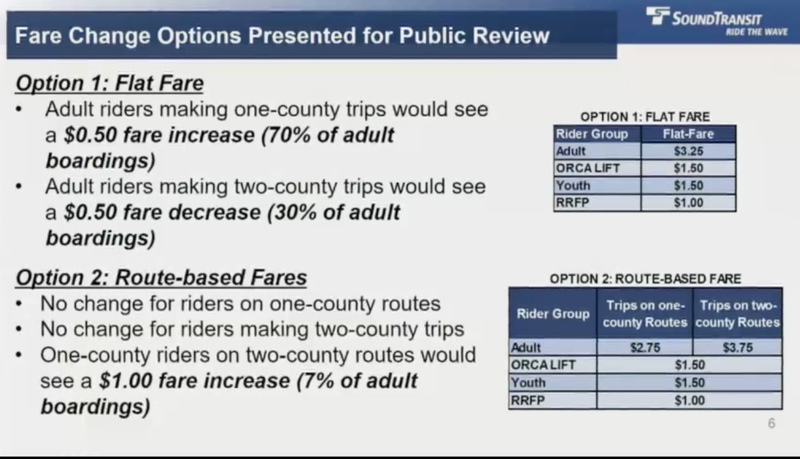 The route-based fare would add much less, only increasing revenue by $100,000 to $200,000, a gain of about 0.3 to 0.7%. Before fares can change, ST must perform an analysis to determine how the changes would impact low-income and minority populations. 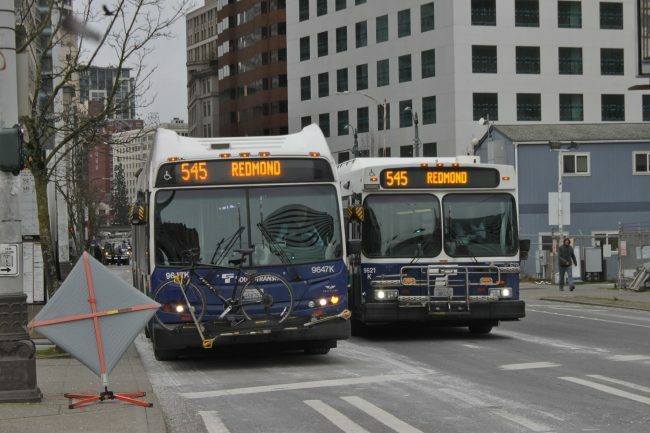 The agency said “neither option would create a disproportionate impact on low-income riders.” ST staff also recommended conducting ORCA LIFT outreach to ensure all riders who qualify for the program are enrolled. I’m sure they will use this extra money for good use, but that’s not the point. The point is that taking a hard look (and letting riders consider the effects) of reducing the farebox recovery in return for a more practical system that’s financially accessible to more people. Give us a proposal. Show us how the bus system would look like if farebox recovery went down by 33%, but we only had to pay $2 to ride. By the way, if 50% more people rode the bus due to lower fares, that would help with that, wouldn’t it? It’s not a taxi company, right? How sad would it be if we build a great transit system for the city and surrounding areas with a ton of tax money and a ton of time, but we set our fares so high that any trip less than 20 miles is totally impractical? I sure hope we don’t starting planning routes around fare practicality, because this kind of structure somewhat precludes efficient route planning like the 512, which makes more stops, is slightly slower, but runs every 15 minutes and allows for short trips and long trips. It’s already so bad that we have (even though transit should be accessible to the poor already), we have to have a special lower fare for poor people because the regular fare is too high for poor people!! Lastly, where does it stop? Link still has distance-based fares, why not make it just like ST Express and charge everyone $3.25? The same logic applies. It is confusing. People forget to tap off. I’ve even got a warning because I forgot to tap off once and got on again and the second tap was the tap-off. How about $3.25 for ST Express and Link? And maybe $4.25 for Sounder? How about $3.75 for ST everything? Clearly that would be ridiculous. Sigh. I was hoping that with ORCA 2, they would look at adding tap-on tap-off to buses too, with readers on rear doors. Or implement a negative balance like you see on the Clipper card in SF (for super long trips on Caltrain and BART). Why are we making our “smart” system dumber and not smarter? I agree with all of your points. To make matters worse, we really haven’t simplified things for a lot of the riders. As this article points out, most of ST riders are staying within the county — King County that is. That means that if you are in, say, Issaquah, and want to get to Seattle, you can ride the 216, 218, 219 or 554. But the 554 will cost you 50 cents more. So not only are things really expensive, they aren’t even consistent. It is one thing to pay extra for a bus that goes between cities (e. g. the 512) — it is another to pay extra for essentially the same bus, just one run by a different agency. I also find it baffling that neither ST nor Metro will give a discount for ORCA fares, yet have no qualms about discounting long distance routes. Me too. There should be a discount for not making the bus wait, which gobbles up service hours and rider patience. At the very least both agencies should be giving ORCA users a discount for speeding up the bus. Now especially on the cusp of Carmageddon. I generally support simpler fare systems on the grounds that speeding up boarding is a good thing. I do see the irony that in the Seattle area, ST buses are operated by Metro. And occasionally use Metro buses. So a 312 and a 522 might show up at the same time, both in a green Metro bus, both with a driver in a green Metro uniform, both covering almost identical routes between Bothell and Seattle, and 1 bus is 50 cents cheaper than the other. I think the world of Sound Transit and its staff. I just wish we had transit agencies in general structure themselves more around public accountability and genuinely listening to the riders. Genuinely listening being making substantive changes based on genuine public input, not a few. It’s no different from Community Transit charging more for its commuter routes, which overlap with the 511/512/513. I basically agree with all this as well, except the idea of tapping off buses. I wouldn’t support anything that slows down the boarding/deboarding process anymore than it already is, and would support most reasonable plans to speed it up. Vancouver tried tap on tap off on buses and it failed miserably. So much so they abandoned it and buses are now all one zone fares. Fare isn’t the barrier for most non-riders. It is convenience, flexibility, and travel time. I traveled by bus, for several years, all on my employer’s dime. Boy was it a pain in the rear, and I only did it once or twice per week, because it took up so much of my day. Had the bus been fast and efficient, I probably would have willingly paid my own money to use it. All that being said, commuters living near zone boundaries get arbitrarily penalized. What was the old fare from Federal Way to Tacoma again? Canyon Park to UW Bothell? And, please compare to Issaquah to Seattle? Or Federal Way to Seattle? And how do the distances compare? The idea posted here a month or so back of using the longest gap between two stops on a route as the differentiator seemed brilliant. It was intuitive – everyone knows which routes are the expresses, it allowed agencies to charge more for more expensive routes, and it didn’t create arbitrary disincentives to take a short route that happened to cross a zone boundary. Is there some downside I’m not seeing? Steve, the folks near the county line often don’t have no option other than to ride a single route, because you’re located at the division between two county metros, and the only thing linking neighboring cities is a long-haul “express.” So those of us at county lines still get screwed. I pay the same taxes proportionally as the guy up in Renton or Bellevue but get far inferior service. And, now I am expected to also foot the bill for higher fare when, in reality, I am stuck with half hourly service at peak hour only and, generally, poorly-timed layovers at one end or the other? When I hear people from Bellevue or Seattle whining about losing their one-seat ride, all I can say is try getting somewhere in Federal Way or Auburn by bus… in the rain. You’re going to arrive hours late – no exaggeration – usually soaked. Must be nice to afford living so close to all of the good paying jobs. We aren’t all so lucky. It’s arrogant and unrealistic to say that fares don’t matter. I was speaking to a friend who had a visitor from out of town. She said they drove downtown and parked because it was no more expensive than the $12 round trip fare on Link for 2 people. Is it equitable that it should be $3.25 from downtown Bellevue to downtown Seattle on ST550 while it will be $2.75 to UW on MT271 or from Eastgate to downtown Seattle on MT212 series? Bellevue to downtown or Kirkland to UW at the same price as Dupont to Seattle or Everett to Tacoma? How big is the problem to allow 1-zone and 2-zone fares on the buses that provide both rides? I saw leave the 2-zone fare system alone. I want the cost to be the same between two points in King County whether it is on MT or ST buses. Important correction: it is a fare increase for 70% for all *full fare adult* passengers. I’m curious to know what percentage this is of total riders, when also including youth, ORCA Lift, RRFP, and senior riders. Moreover, many of the riders whose fares go up won’t notice. A large chunk of ST Express boardings pay with a Business Passport ORCA. If the bottom line is to increase revenue, then it is puzzling why ST would risk losing up to $600K annually by encouraging those with (non-Passport) monthly passes covering $3.75 to reduce their pass value by 50 cents. Either way, I am delighted by the part of the real proposal and the unworkable straw proposal that brings down the reduced fares for inter-county travel to the same as that for intra-county travel. Bring out the comfy fares! In general, services going between the same two points should cost the same amount. It doesn’t make sense to give people price incentives to choose the 212 over 554, or 594 over Sounder. I guess most people have employer-paid passes, so it doesn’t really matter, but for those that don’t, fares really do matter. We’re already the point where it costs $22/round trip for a family of four to ride the bus downtown for a special event ($2.75 * 4 * 2). For those willing to walk a few blocks, it is actually cheaper for a family to drive and park than it is to ride the bus. This is nuts. I agree. I also wonder how many riders are getting employer-paid passes and how many are paying for it themselves. Wouldn’t “a family of four” imply two youth fares? Youth cards are difficult to get so a family of infrequent riders most likely would buy adult cards for their kids. True and quite frankly, I’m all for a family fare package to encourage families to go to venues via public transit. If that means kids ride free when traveling as a family, great. Even last December, “requested that ORCA agencies educate local event organizers to be more transit friendly when venue planning” to the ORCA Joint Board: https://www.soundtransit.org/sites/default/files/orca-joint-board-draft-meeting-notes-12112017.pdf and last July, “A reduced family fare product for a family to ride while using just one ORCA card” – https://www.soundtransit.org/sites/default/files/orca-joint-board-draft-meeting-notes-07102017.pdf . If we want employers to pay more into the transit system we should charge them more and not use “employer-paid passes” as a cover excuse to raise fares on everyone else. Right, it’s inequitable and false to assume a majority of riders gave employer-paid passes and everyone else doesn’t matter. I’ve never had an employer-paid pass, although I’ve sometimes had employer-subsidized or pre-tax passes. People working for small companies don’t get any of these, and people working for out-of-state companies often can’t get their company to care about it. I do notice the round trip fare and I dislike it when i am paying different prices for the same trip. Sounder from Tacoma to Seattle will become $2/trip more expensive than the bus. Sounder is a “premium” service. Even though its route is longer and it has several stops, it takes only a few minutes longer than the scheduled time of the bus. But it is almost always on time, it is comfortable, and the higher fare ensures that the ridership is “well-behaved”. There’s a debate whether Sounder is a premium service. ST initially positioned it that way by setting Sounder’s fare higher than ST Express. But there’s an argument that Sounder should be the baseline because it’s high-capacity transit, and ST Express between Kent and Seattle is MIA. One of the reasons the peak 59x exist is that Sounder doesn’t have the capacity for all those passengers: it can’t fill up in Tacoma because half its ridership is in Auburn and Kent. That gets into BNSF’s expensive time slots and freight traffic, which is the biggest bottleneck to increasing Sounder service. The way things are going it looks like Link will be the baseline, ST Express will be truncated, Sounder will remain as a second service, and Metro will take over running all-day express buses to Kent and Auburn (Seattle-Renton-Kent-Auburn, not sure if it will stop in Renton). The higher rates for ST Express vs. a nearly parallel local service might be viewed from the assumption of premium experience on ST Express – more comfortable seats, fewer stops, faster travel time, and years ago – air conditioning (although Metro has upgraded their fleet to be all AC). Next time I raise my tenant’s rent I should rell them I am doing it to simplify my bills. What a scapegoat excuse. I would look at it as this is making ORCA Next Gen work a lot easier and broaden the ability to recruit contractors & consultants for that. Because that’s the main reason driving this fare simplification. Most regional transit systems around the world use some form of zone-based or distance-based pricing. Any contractor or consultant worth hiring is more than able to implement our system. The given reason is ignorant of international best practices. But the ORCA pod is attempting to run NextGenORCA in-house. If that means zone resets when boarding the bus have to go away, I say good riddance. But for long-distance express bus services, I think it is poor planning and accounting to make them cost the same as a short-distance bus route. Community Transit agrees that long-distance bus routes should cost more — a lot more. Dropping the long-distance fare from $3.75 to $3.25 is going to cost ST up to $600K in annual lost revenue, which is almost as much money as this fare change is supposed to bring in. My more conspiratorial theory is the $3.25 fare amount is an attempt to get us to shut up about raising cash fares to the next dollar. Alex Hill, see transit systems in Europe, especially German-speaking countries, where fares are mode-neutral. Key word being “regional”. The core cities might have a large flat fare zone but traveling to adjacent cities or suburbs whether by bus or train the fares are zonal. Brent, zone resets were poorly implemented in the original ORCA system. Drivers had to navigate multiple screens on their console to get to the feature and there was no facility for riders to do it themselves other than through an obscure feature on the ORCA website. They couldn’t be bothered to learn from other cities and fix it so this is what we get. The other systems that did this also had systemwide proof-of-payment and high usage of prepaid fares/passes (pre-smart card) so much of the delay caused by driver fare collection is eliminated. Guys, I’m just passing along from transit staffers I’ve talked to and ORCA Joint Board Meetings. Sorry to say, the train has long ago left the station on this one. We aren’t going to wind this back. Duesseldorf has “A”, “B”, and “C” passes which you can buy a week at a time. An A pass covers Duesseldorf city. A B pass includes the adjacent suburbs. A C pass covers the entire transit region (the Rhein-Ruhr region, including Essen but not Cologne). That includes all transit modes: bus, U-Stadtbahn, S-Bahn, Wuppertall Schwebebahn. So there’s no reason to pay single fares unless you’re traveling only one or two days in a week. Single S-Bahn tickets are per kilometer plus a surcharge for short trips. You need this if you go outside the transit region, such as to Cologne. I don’t know if you can get C passes for both the Rhein-Ruhr and Rhein-Sieg regions and ride unlimited between Duesseldorf, Cologne, and Bonn. OK, I’m going to try the second half of my comment again because it’s substantive and important. I really wish the voices of Seattle Transit Blog commentators were more heard before this train left the station or this bus left us all behind. I do. I wish there was a way to make transit agencies listen more to these good, thoughtful comments above. Thanks. Most places have all-day regional rail to all the cities in the region, so they don’t really have long-distance buses and the issue doesn’t come up. In Belfast the regional trains have a few stops in town which may be useful for local trips, and then continue on to the surrounding cities and to the coast. (I took one to Bangor, it ran every hour or so midday.) Glasgow has a similar setup. and the’re popular with commuters peak hours. I suppose that depends on where you are. Perth (when I was last there) had nine concentric zones that extended quite far into the periphery; tap on and tap off. Singapore has some byzantine per-km rate that leads to very odd fares if you use the smart card (although discounted); tap on/off. Helsinki? Tap on/off. In Buenos Aires and Inverness you actually tell the driver where you are going and you pay the fare, which will vary on the same bus depending on destination, directly to them based on that; they actually still make change although Buenos Aires has a smart card as well. London? Zone fare; tap on/off. It’s certainly not an uncommon practice, and tapping off at the rear door seems to be manageable even in cities with much higher transit usage (and even with double-decker buses) than Seattle or Vancouver. Golden Gate Transit, which operates express buses from Marin and Sonoma Counties into San Francisco has zone fares, but I can’t think offhand of another bus operator which does. NJ transit has zonal bus fares. You can a receipt when you pay. In theory you are supposed to show the receipt when you disembark. Why can’t transit just do fares same as automobiles? One yearly pass. Only zone lines being two oceans and the Mexican border. As to fare allocation between agencies…how do two countries and all their provinces and states do it? In my own experience, monthly pass has always met needs, cost, and convenience. Think it should be our base fare. Have always stayed with two-zone. But the easier full-regional travel gets with expanding and accelerating service, my lifestyle and choice of work will make Region Wide my usual. “Taps” become a voluntary favor. Which I think most passengers, and all their kids, will be glad to do. Tell people they’re helping the system with the information. Face it that by 2030, average passenger till ride many if not all systems course of a month’s travel. Like with streets, roads, and freeways. Based on my favorite hate right now: Make Seven Agencies (doesn’t that sound like James Bond villains?) start acting like they’re One System For All, as 1996 campaign promised. The better the system, the more likely same passenger will ride multiple services, different routes different days. If all this didn’t work so well so long with cars, it would be easier to get reserved bus lanes. I would be on-board for a single regional fare – bus, train, light rail, ferry – and a monthly pass that covered all agencies. Any adjoining counties/agencies that chose to join would be welcome. Start with the four ORCA counties. Of course… this would require people at the agencies to work together, and we know that would never happen. Verbatim for the answer I got to pointed suggestions on some necessary changes in fare registation: “Not going to happen.” In politics and the rest of reality, nothing ever does. Progress is caused. All those agencies are close enough to being democracies that enough people can make it worth their representative’s effort to grow a brain. Should know the answer to this: only lobbying organization I’ve heard of is Transit Riders’ Union. Know nothing about them. But at worst: any other group close enough to imitate? This seems so short-sighted and customer unfriendly, at least for a within King County perspective. It makes me want to strongly push to return all in-county routes like 540, 541, 542, 545, 550, 554 back to Metro. It serves no purpose to charge different fares for the same journey. It’s just plain annoying and confusing. We just had Metro take a step to unify in-county fares and ST just blithely nixes it. It is also a stupid and counterproductive discount for the true long-distance service, some of which strangely directly completes with Sounder at a now-greater discount. Take Fare Setting away from ST. Let Metro, CT and PT set the fares.